As you remember from Activity 2: The People of North Africa, the societies of North Africa are culturally diverse and geographically dispersed. The rule of the region was often changing, as new mobile groups overran established rulers, and new movements of people destabilized older regimes of power. 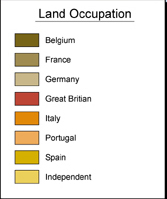 Nation-states, as we know them, didn’t exist in world history until the 19th century, and in North Africa they were for the most part created by colonial rulers. For instance, though Morocco has the longest existing monarchy in the world, the actual borders of the country were never entirely set —they were in flux as groups of people loyal to, or allied against, the throne moved around, conquered or took over new areas, etc. Review the maps below, and notice how the colonial borders shifted and where the current political borders are. When European powers divided the continent between them, they created the borders which are, for the most part agreed upon today (we will see in our discussion of the Western Sahara situation how this colonial division has created problems for current states in the region). The colonists often capitalized on ethnic divisions in the region (especially between Arab and Berber peoples) to take over territories. An excellent history of this is recounted by Gavin Maxwell in Lords of the Atlas (2000). For a review of the political impact of colonialism please refer to Module Ten: African Politics and Government, Activity Three—The Political Heritage of Colonialism. Colonial governments differed in the amount of autonomy they granted indigenous inhabitants, the amount of political opposition they allowed, the involvement of locals in the governance of their country, the ability of elites to gain education in the ruling country, etc. When the North African countries were granted independence (see map below), they tried a variety of governance systems, and these have adapted over time to their diverse populations and situations. As with the rest of Africa, there are different types of governance and political practice in North Africa. For a review of politics and governance in the continent please link to Module Ten: African Politics and Government, Activity Four: Politics and Government in Post-Colonial Africa. Algeria, Egypt, and Tunisia are all republican democracies, meaning they are governed by elected legislative bodies. Though these countries are democracies in structure and substance, they are not necessarily like the United States. In structure, these governments modeled themselves after European parliamentary systems in which heads of state (head of the executive branch—the president) and heads of government (head of the legislative branch—the prime minister) are different. They all support many political parties and representation is proportional (seats in the legislature are awarded not to which party wins a certain region of the country, but by percentages to each party based on what percentage of the vote they received). Both Algeria and Egypt have bicameral legislatures while Tunisia is unicameral. On the substantive side —that is the quality of democratic practice —protection of political and human rights in these countries, may challenge our understanding of democratic practice. To be sure, there is a variety of individual freedoms in each country. All three allow all citizens above the age of 18 (20 in Tunisia) to vote, and Egypt requires all citizens 18 and above to vote. However, each country has made illegal certain forms of political participation. In Algeria and Egypt, political parties based on religion have been outlawed. In Tunisia, one fundamentalist Islamic party is outlawed as well. Legislators and executive officers (presidents) serve terms of 5 to 6 years. Freedom of the press is restricted to different degrees within each country. The governments of these countries defend the restrictions on political rights arguing that political rights without restrictions would result in political chaos and violence. They point out that social and political instability caused by poverty, the lack of economic opportunity, and social displacement (urbanization and modernization) have created conditions that foster Islamic fundamentalism which is completely opposed to democratic principles of governance. Consequently, these governments argue, it is necessary to restrict some political and democratic rights in order to protect their countries from becoming much more undemocratic. Morocco is a constitutional monarchy, though it differs from Great Britain and other constitutional monarchies you may know. In Morocco, King Mohammed VI, who just took the throne when his father, Hassan II died in 1999, runs the executive branch and appoints the prime minister and his cabinet. The legislative branch is a bicameral Parliament, the upper house is elected indirectly by local councils, professional organizations, and labor syndicates for nine-year terms, while the lower house is elected by popular vote for five-year terms. Libya is a unique government in the region for two reasons. First, in theory, it is a socialist democracy in which people govern themselves through local political councils. Second, though these councils do exist and function, in reality the nation is governed by a military dictatorship which hasn’t changed since it took over in 1969 when Colonel Muammar Quadhafi took power in a military coup. The one factor all these countries have in common is the attempt to integrate some aspects of Islamic law into the judicial system of each country. Islamic law -Sharia law -is included to varying extent in the national laws of the country. Indeed, only in countries such as Saudi Arabia and Afghanistan under the Taliban regime was Sharia law, as extracted directly from the Quran, the complete law of the state. Interestingly, a completely different adoption of Islamic rule and application of the Sharia is found in Libya. Muammar Quadhafi, the military dictator, bases laws on the codes of behavior outlined in the Quran, yet considers Libya to be a Socialist Islamic State! You may have been taught about the concept of the separation of church and state in your social studies or government classes. This concept arises out of the enlightenment and the civil wars in parts of Europe where various Christian factions battled for political power. However, even these nations (including the U.S.) often maintain strong cultural ties to churches. Islam, unlike Christianity, was developed as a state religion even at the time of its birth. The Quran (Koran) includes instructions on running governments, on the rights of people, and on the relations of Muslim citizens with each other (especially in civil laws). As in other regions of Africa, in the post-colonial era North Africa has experienced political conflicts, both within individual countries and between neighboring countries. We will briefly look at examples of each type of conflict. For a review of political conflicts in the rest of Africa, please link to Module Ten: African Politics and Government, Activity Six: International Relations. Because national borders and movements of people were fluid before colonialism, the arbitrary borders, drawn by colonialists, have been in dispute in many areas throughout post-colonial Africa. North Africa is no exception. An excellent example of this is the disputed territory of the Western Sahara. This area, between southern Morocco and Mauritania, was colonized by the Spanish rather than the French who colonized Morocco (with the exception of two Spanish cities on the Mediterranean coast), Algeria, and Tunisia. As the people of the region (called Saharawis) became sedentary, they began to reject colonial leaders and demand their independence. 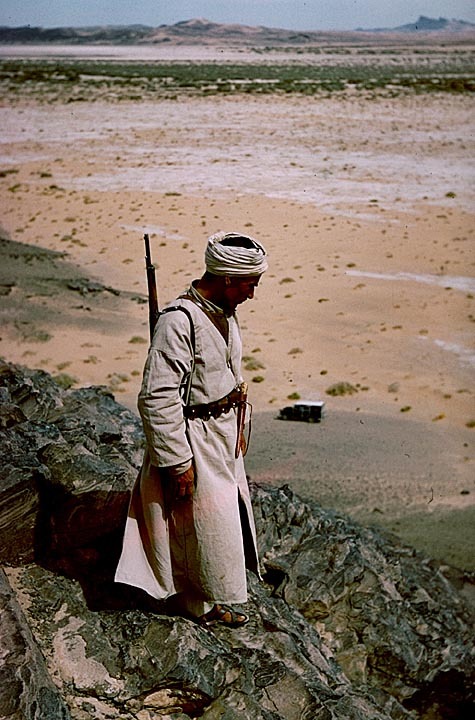 In 1973, the Polisario was formed to wage guerrilla warfare against the Spanish colonists. 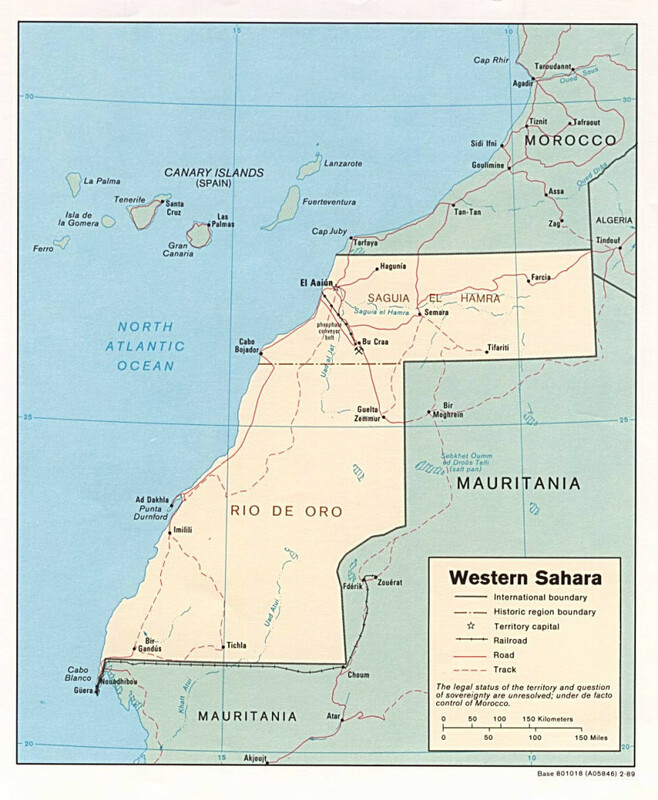 The Spanish gave up rights to the territory in 1976, granting the northern two-thirds to Morocco and the southern third to Mauritania. However, the Polisario demanded independence completely for the territory and Mauritania gave up her portion in a treaty signed with the group in 1979. Morocco, however maintains her sovereignty over the entire territory, including the portion first ceded to Mauritania. Before signing the treaty with Spain, 300,000 soldiers and citizens of Morocco participated in the “the Green March” and walked south across the border, claiming Western Sahara as a Moroccan province (the anniversary of the Green March remains a celebrated national holiday in Morocco). Morocco and the Polisario waged war until a UN-brokered peace agreement in 1991. Because of Algeria’s support for the Polisario, relations between Algeria and Morocco were cut off at times and remain very tense. A referendum on the future of the territory, overseen by the UN, has been repeatedly postponed. 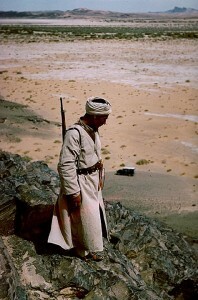 Moroccan Soldier Patrols the Sahara © Africa Focus: University of Wisconsin. You may be wondering why all the fuss? There are both economic and social causes of this conflict. Western Sahara is a sparsely populated, very hostile desert, with virtually no arable land. However, it is rich in phosphate and in iron ore and supports rich fishing waters along its coast. As we will learn in Activity 4 that follows, phosphate is a valuable mineral and is a main export of Morocco. Both sides consider the wealth of that resource worth the fight. In addition to economic concerns, the identity of the Saharawi people is also contested. Saharawi groups have, at various historical times, been within the cultural and governance sphere of the Islamic states which ruled the region since the eighth century CE and from which the Moroccan dynasty traces its origin. In effect, Moroccans see Saharawis as another of the diverse peoples that make up the Moroccan Nation, like other Berber and Arab ethnic groups. Polisario argues that Saharawis are a separate nation from the Moroccans and that the Saharawi people should be independent of Moroccan rule. The situation remains complicated: a popular referendum to determine the future of the territory is constantly postponed as government and Polisario (along with United Nations negotiators) disagree on who should be allowed to vote (pre-Green March residents, current residents, Saharawis in Algerian refugee camps, etc. ), how the elections should take place, and what the referendum should say. The African Union (formally known as the Organization of African Unity/OAU) and the United Nations have been engaged in the crisis in the Western Sahara since it began. Both organizations have unsuccessfully attempted to mediate between the Polisario and Morocco since the beginning of the dispute in 1976. The OAU gave up it attempt to mediate in the dispute in the 1980s when Morocco withdrew it membership from the OAU because its government felt that the OAU was biased in favor of the Shararwi. Morocco is the only African nation to withdraw its membership from the OAU/AU. Currently, only the UN is actively engaged in a mediation effort. James Baker, former U.S. Secretary of State in the first Bush administration, is leading the U.N. mediating team for the Western Sahara. To read competing points of view on the subject, ask your librarian for articles and books on the Western Sahara and do internet research. Some links are provided in the links section on this page to get you started. Without a doubt, in the recent past Algeria has suffered more from internal conflict and violence than any other country in North Africa. It is estimated that in the decade between 1992 and 2002 CE more than 100,000 Algerians were killed as a result of politically motivated acts of violence. What were the causes of this political violence? To answer this question we must go back in history. Algeria has a long history of occupation by outside rulers. The coastal region of contemporary Algeria was an important part of the Roman Empire, providing wheat and other agricultural products that helped feed Rome. In the eighth century CE the indigenous Berber peoples were conquered by the rapidly expanding Arab Islamic forces from the east. In the 16th century Algeria became part of the powerful Ottoman Empire. And, finally in 1830 the Ottomans in Algeria (but not elsewhere) were defeated by the French who fully colonized Algeria in 1848. Algeria became the first of many French colonies in Africa. The history of French colonization in Algeria was unique—very different from the history of France’s other African colonies. Unlike France’s other African colonies which were thousands of miles from France, Algeria was located less than 500 miles away, just across the Mediterranean Sea to the south. In addition, the coastal region of Algeria, though very narrow, is very amenable to agricultural, particularly to the cultivation of fruits, grains, and vegetables. These two factors, geographical proximity to France and agricultural potential, made Algeria attractive to immigrants from France. In France’s other African colonies the only French people to live there were officials of the colonial government, some missionaries, and a few business people. Moreover, most of the French officials who lived in an African colony spent only part of their adult lives in that colony. The situation in Algeria was different. During the nearly 120 years of French colonial rule thousands of French people moved to Algeria and settled there, some families for multiple generations. These settlers took control of the best agricultural lands in the country and also soon dominated the economies of urban areas. The French settlers came to view Algeria not so much as a French colony, but as a province of France, separated from the rest of France by just a couple hundred miles of the Mediterranean Sea. Algeria, as a settler dominated colony, shared similarities with South Africa and Rhodesia (Zimbabwe) which were also settler dominated colonies within the British colonial system. You will learn more about these colonies in Module 20: Southern Africa. In the 1950s and 1960s when France (and other European colonial powers) submitted to the demands for political freedom by the African populations in their other colonies, due to resistance from the settlers in Algeria, France refused to grant independence to Algeria. Convinced that the French government would continue to side with the interests of the French settlers in Algeria, under the leadership of the National Liberation Front, and inspired in part by the American revolution, Algerians undertook a war of liberation which lasted from 1954-1962. This struggle resulted in the deaths of tens of thousands of Algerians and Frenchmen/women. On July 5, 1962 Algeria became independent with great optimism, based on part on the growing revenues from her new petroleum industry. During the next three decades (1962-1991) Algeria was governed by civilian and military governments which were secular and socialist in their orientation. Unfortunately, many of the economic policies put in place during this time did not result in steady economic growth, leading to increasing dissatisfaction with the government. The military regime, which governed Algeria from 1965, did not tolerate public dissent. By the late 1980s many Algerians, unhappy with continuing economic decline and their inability to express their political displeasure, responded positively to new Islamic movements which claimed that a return to strict Islamic observance was the solution to Algeria’s economic, social, and political problems. At the same time, the military regime responding to domestic and international pressure, agreed to return Algeria to civilian rule and in December, 1991 held the first elections in nearly 30 years. The elections were clearly and overwhelmingly won by the Islamic Salvation Front which advocated the establishment of an Islamic government in Algeria. The Algerian army, with the tacit support of Western governments, decided to ignore the results of the elections and installed a civilian government which excluded the Islamists. This clearly thwarted the will of the majority of the people who rallied around the Islamic Salvation Front (FSI) to resist continued rule by a military controlled regime. The struggle for power between these two groups led to a civil conflict which resulted in the death of around 100,000 Algerians (almost all civilians) from 1992- 2000 CE when the FSI agreed to disband. Why did the military, with the tacit support of France and the U.S., refuse to recognize the democratic choice of the Algerian people? These groups did not want to see the establishment of another Islamic Republic in region (Middle East). What is your position on this issue? Are the perceived national security concerns of European countries and the U.S. more important than the democratic rights of the Algerian people? Or, was the Algerian military justified in quashing the will of the people because they believed that an Islamic regime would be un-democratic through policies which might greatly restrict the rights of women and Algerians who are secular—who have no interest in adhering to Islamic law? Finally, whichever position you might take on these questions, is any political position or ideology (belief system) worth the lives of 100,000 individuals? Fortunately the Algerian story became somewhat more positive in the early 21st Century. After elections in 1999, which banned Islamic parties, the FSI agreed to disband. Political violence did not disappear in Algeria, continuing at a much reduced level. In April 2004, Abdelaziz Boutefilka (who was first elected in 1999) won a hotly contested presidential election with 85% of the vote. However, Islamic parties continue to be banned from participating in Algerian elections. It would be inappropriate to ignore the issue of terrorism in this region. However, it is also inappropriate to suggest or assume that North African (and other) Islamic governments support terrorism or violence. The people of North Africa have been familiar with terrorist acts perpetrated against their own governments (and against the people themselves) by a variety of terrorist groups. Many of these attacks have been by Islamic fundamentalists hoping to “purify” their society and the political system of secular influences and to create state systems based exclusively or primarily on the Quran (you will remember from Learning Activity 2: The People of North Africa that fundamentalist revolutions have been common in the region since the Arab invasion of the late 600s). Some of these movements have been nationalist movements against governments or ruling political parties (like the Polisario in Western Sahara) and still others have been in response to former colonial regimes (terrorist bombings in France in the mid-1990s). Libya under Muammar Quadhafi supported some of these groups. Indeed, the UN imposed sanctions against Libya for this reason from 1992-2002. However, in 2004 Quadhafi publicly renounced the use of terrorism, took responsibility for the bombing of the Pan American flight over Lockerbie, Scotland (paying millions of dollars of compensation to families of each of the victims of this tragedy), and dramatically ended Libya’s nuclear weapons development program. The other nations of North Africa long ago outlawed extremist and violent activities and have taken leading roles internationally in supporting peace initiatives throughout the region, the Middle East, and the world. 1) The National Democratic Institute (NDI) (https://www.ndi.org) works to expand democracy around the world. Considering their mission and activities (from the website), and what you’ve learned about the peoples and governance structures of North Africa so far (and from web sources listed below), what do you think about 1) their chances of success, and 2) whether they should continue their efforts in these countries? You may, if you like, choose one country specifically and discuss in detail why you think NDI’s democracy is or is not appropriate for that country at this time. First, read competing points of view on the conflict in the Western Sahara—ask your librarian for articles and books on the Western Sahara and do internet research -some links are provided in the links section on this page to get you started. Chose one side of the conflict to study: the Moroccan government, the Polisario, the United Nations, Algeria, etc. Work in groups around the chosen political organization and critique its position, analyzing both the pros and cons of the organization’s goals and actions. For instance, one group will analyze the actions and goals of the Moroccan government, outlining what has been successful and unsuccessful in reaching the goals of the Moroccan government. Another other group will do the same for the Polisario, another for the United Nations, etc. Present your analysis to the class and discuss why you think some actions have succeeded and others have failed at resolving the conflict. Now brainstorm with your class how the situation might be resolved taking into account the goals of all the actors. Write a class letter to the United Nations Mission for the Referendum in Western Sahara detailing your recommendations for resolving the conflict.